I almost never try creamy pasta sauces, as I was turned off so many times by overly rich and heavy alfredo sauces when they first became popular (what’s it been, about a hundred years?). But I couldn’t resist giving the sage cream sauce at Lucy’s Ravioli Kitchen a try, and was so glad I did. I had butternut squash ravioli (alas, from elsewhere, and not as good as Lucy’s) in my freezer begging to be used. So when I swung by Lucy’s for bread one morning, I grabbed the sage sauce (and some of their white clam and rustic tomato sauces too). 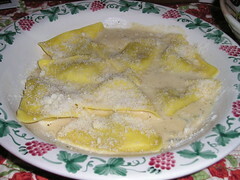 Meanwhile, I can attest that Lucy’s own butternut squash ravioli are the best, because of the crushed amaretti they use, which add exquisite flavor and texture. The sage cream sauce was not heavy, and it had a bit of tang to it, keeping the flavor fresh and light. I scooped some of the starchy pasta water into the serving bowl you see here, too, and it all combined to make a delicious meal, with a nice salad on the side. « It’s Taste of the Nation Time!